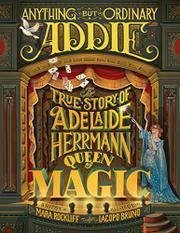 Artwork and layout reminiscent of 19th-century posters and paper dolls tell the true tale of magician Adelaide Herrmann, once known as the Queen of Magic. “Addie never wanted to be ordinary,” states the first double-page spread, in which a little redheaded white girl in a bright orange dress and white petticoat flaunts her hoop and stick against a background of somber, sepia-toned family members. A mustachioed man, outlined so as to look like a cutout from a piece of cardboard, is clicking his cumbersome camera at the group. The next spread shows dreamy, flame-haired Addie surrounded by circus characters, and decorative text on a marching-band-member’s drum says, “Addie wanted to astonish, shock, and dazzle.” As the story progresses, Addie moves from being a prima ballerina to boldly riding a “boneshaker” (bicycle) to marrying her dream man: famous magician Alexander Herrmann. The text asserts that “Alexander was no ordinary husband. He set fire to Addie. He chopped off her head….The two of them got along splendidly.” The art makes the piece much more than simply a humorous biography of a spunky woman artist; readers get a taste of elite and artistic lives during Addie’s lifetime. Addie’s willingness to perform the feared-and-revered bullet-catching trick to retain popularity after Alex’s death is a perfect way to end the entertaining, true story.